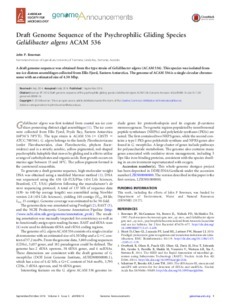 A draft genome sequence was obtained from the type strain of Gelidibacter algens (ACAM 536). This species was isolated from sea-ice diatom assemblages collected from Ellis Fjord, Eastern Antarctica. The genome of ACAM 536 is a single circular chromosome with an estimated size of 4.50 Mbp.